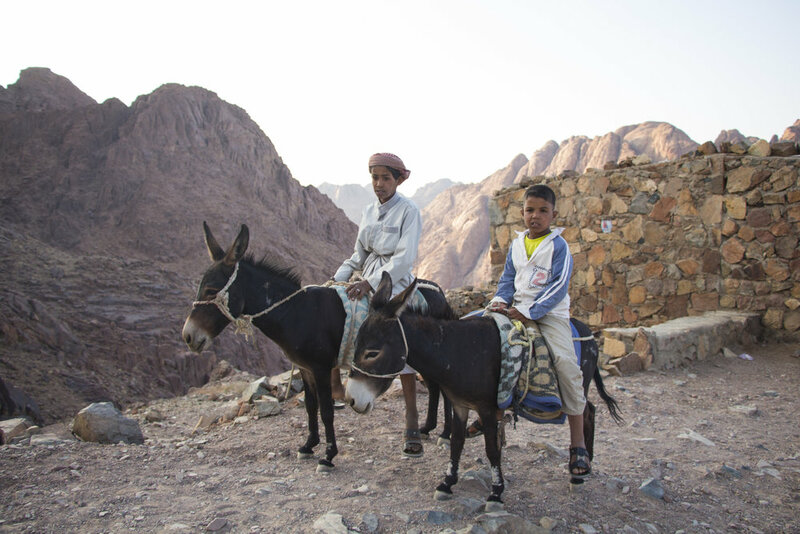 We reached Ras Sudr, a small city before our final destination, St. Catherine, Egypt. This city was a resting stop for us because we had been driving all day and night on our road trip journey in anticipation to reach St. Catherine. After driving through the blazing hot desert for many hours we desperately needed a place to sleep, eat and recharge for the next day. We probably only had about 5-6 hours before we were up and running for breakfast and on our way. Even though there was little to no time to rest, our little around-the-world family liked to spent nights together reconnecting whether it was hanging out by the fire, drinking tea or sharing laughs, we spent that midnight time together. It was like tradition, we were family on this trip. Before bed, we were instructed to rest up and pack our bags, (lightly but mindful of lots of warm clothing, water and many snacks!) the morning was going to be busy so we needed to prepare. After breakfast, our entire group headed to our two mega buses and drove a few more hours to Saint Catherine, Egypt. This is where the famous Mount Sinai of Egypt is located, the mountain Moses is known for climbing high to speak to God. We were on our way to climb this amazing mountain right to the top! Before the 16km adventure started, we were prepped by the Dune Raider's, our travel guides through Egypt. Khaled Senosi, leader of Dune Raiders, made sure the photographers knew what they were getting into image wise. He explained to us that the beauty we were about to encompass was one like no other. It was going to be one of the highest mountains any of us have ever climbed and the view was going to be breathtaking at the summit, so, camera's up and eye's opened. Senosi went into great detail about the people who lived in the mountains and helped us to understand that we were simply visitors in this space and were expected to respect the mountain, the people and their lifestyles. Getting to know the people that inhabit the mountain and asking whether it was okay to create an image with them was far more important than snapping pictures in people's faces without context. Respect the space you're in. Before the climb, Senosi warned us that this was going to be very heavy on our bodies and a lot of us were at different experience levels in regards to hiking, so we needed to take care of each other out there. We are only as strong as our weakest link and boyyyy, was he was right about that. I remember thinking to myself about an hour and a half in, "Oh my gosh, if I'm tired now how am I going to get to the top of this mountain?!?!". This was Mount Sinai, people.....MOUNT SINAI. This was a 16km, 8 hour massive, biblical-famous, undeniably gorgeous rocky mountain climb. This ain't no beginner hike. We stuck together the whole way through and once it reached dark we rested on the mountain with other mountain-ers. They cooked us a campfire dinner of rice, meat and beans (probably the best meal I've ever had, no joke) and sat around the fire laughing and enjoying each others company. So peaceful, so beautiful, so familiar. After dinner, we were back up on our feet on our way to the next stop on the mountain. We reached a flat area of Mount Sinai where we would sleep under the stars and sip on hot chocolate for the rest of the night. From this point there were only 700 steps up a make shift stair case at the top of the mountain, the summit was only 700 STEPS AWAY! We had accomplished majority of the mountain and in a few hours, just minutes before 5AM, we would witness the sunrise at the summit. Senosi was absolutely right. In that moment when the sun rose, I knew God had placed me on THIS Earth, in THIS country, at THIS time on PURPOSE. I knew His plan for me was to discover the world and breathe air I've never breathed before, see places that I've only ever dreamt of and chase my dreams worldwide. That is His plan for me. Climbing Mount Sinai was the most fulfilling adventure I've experience so far. Who would've thought I would conquer a goal of this magnitude? Sleeping under the stars and watching the sunrise was a breath of fresh air, I wouldn't have wanted to be anywhere else in that moment and I couldn't imagine sharing that experience with a better backpacking family. Moses would be proud! Hahaha! All photos taken with iPhone 6s and Canon T5i (18-135mm lens). ← Welcome to The Family, 2018.